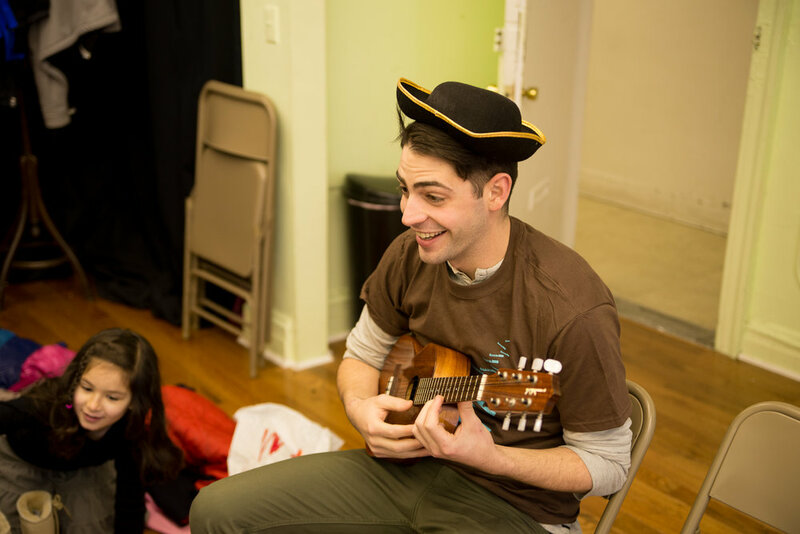 Our mission is to make theater and music relevant for contemporary kids using innovative teaching methods. Founded by professional teaching artists Lena Moy-Borgen and Elisa Winter, Play On! Studios is an exciting option for parents with creative kids who lead busy lives. Play On! Studios is committed to making exceptional theater and music opportunities accessible to everyone. Play On! Studios is thrilled to be working with some of the best actor/musician/teaching-artists this city has to offer. In addition to having incredible experience and rapport with their students, all of our instructors continue to perform and take their art in exciting new directions, bringing an essential professional element to all classes and lessons. Lena has been teaching drama and music since 1997. She started teaching in California with the Piedmont Children’s Theatre, where she was the Assistant Director until 2005. In that time, she received a BFA in theater from NYU’s Tisch School of the Arts. Lena’s teaching experience is diverse: She has taught programs in clowning at Children’s Fairyland as well as self-defense for young women at Destiny Arts Center, both in Oakland, CA. Here in New York, she has been a board member for Arts For All since 2007. She was also a teaching artist for AFA from 2002-2015, where she taught various workshops in music and drama in local public schools. She wrote the curriculum for one of their flagship programs "Literacy Through the Arts" which is taught in multiple schools in NYC. She was the Co-Head of the Musical Theater program at Bank Street Summer camp from 2006-2010, as well as a teaching artist at the John Engeman Theater on Long Island until 2012. As a performer, Lena has appeared all over New York City on children’s performance tours, as well as prominent off-Broadway theaters such as the Signature Theater Company, the Public Theater, and PS122. She is also a cabaret artist who has performed at Jazz at Lincoln Center, Don't Tell Mama's, the Duplex and more spaces in NYC. In 2011 Elisa co-founded Play On! Studios, where she was able to build her incredible team of instructors and share her fresh perspective and energy with hundreds of students. In 2017 Play Music NYC was founded to take over all private music and acting lessons, group lessons, and Sing On! Children's Choir. Elisa is excited that, through Play Music NYC, more students will have the opportunity to experience this successful program. Head to Play Music NYC to learn more about it!